BELLINGHAM, WA–(Marketwired – March 02, 2016) – eXp Realty International Corporation (OTCQB: EXPI) today announced that it officially welcomed its 1000th real estate professional into its family of agent-owners on Leap Day, February 29, 2016. The Company had 467 agents at the end of 2014 and approximately 650 agents last June. The achievement positions the Agent-Owned Cloud Brokerage among the top 50 real estate brokerages in the United States based on agent count in the context of data furnished by RISMEDIA in its 2015 PowerBroker 500 Report which contained 2014 agent count statistics for the top 500 brokerages in the country. eXp Realty launched in October of 2009 with an aggressive revenue sharing program that pays agents a percentage of gross commission income earned by fellow real estate professionals whom they attract into the Company. In 2013 the Company transitioned into being a public company and in 2014 its initiative of sharing equity with its agents and brokers catapulted it to an accelerated rate of growth and retention. eXp Realty is also one of if not the fastest growing real estate brokerages in a number of cities in the United States most notably Austin and San Antonio, Texas as well as Lafayette, LA and Atlanta, Georgia. Austin, San Antonio and Lafayette all opened in the last 12 months and have attracted some of the best and brightest in their prospective marketplaces. 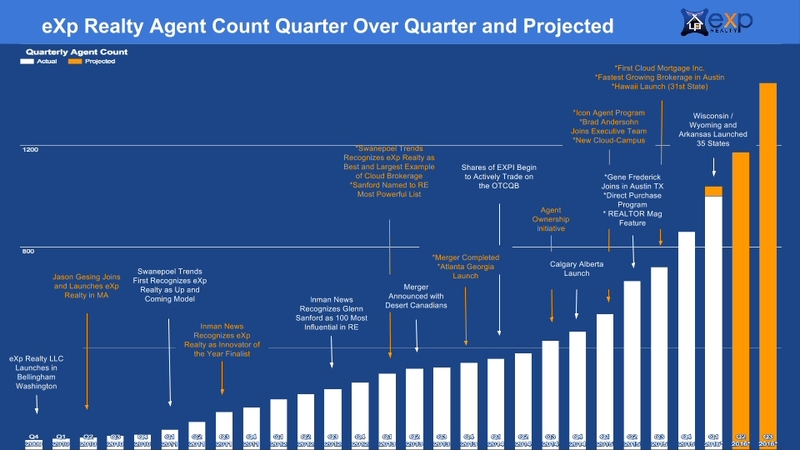 eXp Realty is also achieving net year over year agent growth in most of the markets it is operating in. Such forward-looking statements speak only as of the date hereof, and the Company undertakes no obligation to revise or update them. These statements include, but are not limited to, statements about the Company’s expansion, revenue growth, operating results, financial performance and net income changes. Such statements are not guarantees of future performance. Important factors that may cause actual results to differ materially and adversely from those expressed in forward-looking statements include changes in business or other market conditions; the difficulty of keeping expense growth at modest levels while increasing revenues; and other risks detailed from time to time in the Company’s Securities and Exchange Commission filings, including but not limited to the most recently filed Annual Report on Form 10-K.